I always wanted to make a button shoe l’art pout l’art. Just a piece of art, as much as a pair of shoes can be. This is one of the two types of footwear I always wanted to make – not that I don’t find pleasure making a simple pair oxfords. So this beauty arrived, and I realized, an idiot sanded down the sole for displaying on a bookself. Damn. Luckily, modern CAD technology helped to build it back, and made a replica with some alterations that refers an even older last, from the early 1900’s. Believe me, there is a huge difference between those lasts and the ones today. 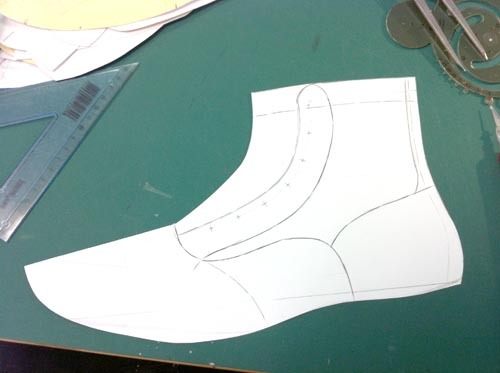 Once again, I am not getting into this topic into depth, just cosider this: paper insole – leather insole. Which one you think is more malleable? 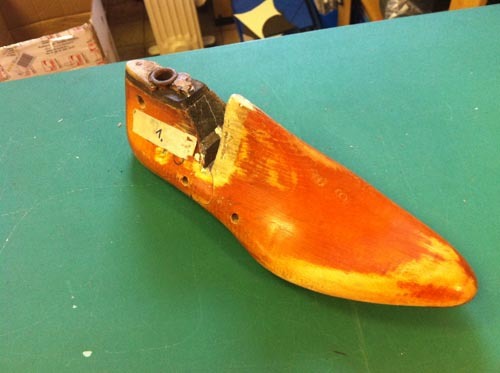 Anyway: old lasts are anatomically more correct, disregarding the factory demands (like rigid paper insoles). After all, people were more educated about shoes and definitely more demanding towards the makers. And the new – with masking tape on. So, I got the right lasts, but I didn’t know what I want to make with them. Honestly, I just wanted to possess them. It took some years to realize that this one is a perfect shape for a button shoe! But, and there is always a ‘but’, this time the challenge was the button itself. Why? Because regular buttons AREN’T STRONG ENOUGH for shoes. Period. No further discourse needed. That’s why there are shoe-buttons, and shoe buttons setters. On the other hand it is almost impossible to get those buttons, as they are not produced any longer (just like so many other things). Carina, my Swedish friend (and also master shoemaker) was so kind to help me with this (and actually many other things). 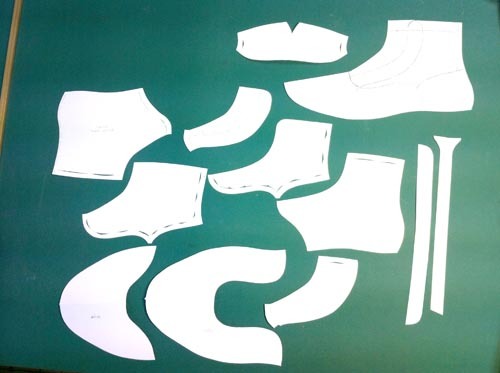 First steps – upper pattern construction! Meanform and the ready made pieces, ready to click and close! By the way: this is not intended as a tutorial. I wouldn’t suggest for beginners to think about making a button shoe. Don’t leave us hanging man!! As I have searched for custom lasts, I think there is a company in Florida that can scan ones feet and make custom lasts, but I am afraid that all they are doing is choosing the closest last pattern they have to your foot and customizing the size rather than all the bumps and variations in toe proportions, heel shape, instep, etc. We have the technology. Why can’t we have custom last specialists? What is wrong with our economy that we can not have truly comfortable non-foot destroying shoes? I love the idea of button shoes. I know they would take longer to put on, but so do my Vibram 5 fingers that make my feet feel really good. When my feet feel good I feel good! I stand to paint my landscapes and if my feet hurt, my paintings show it! One could probably create a foot cast and have it scanned into some of the new 3D computer programs that can then sculpt a last.